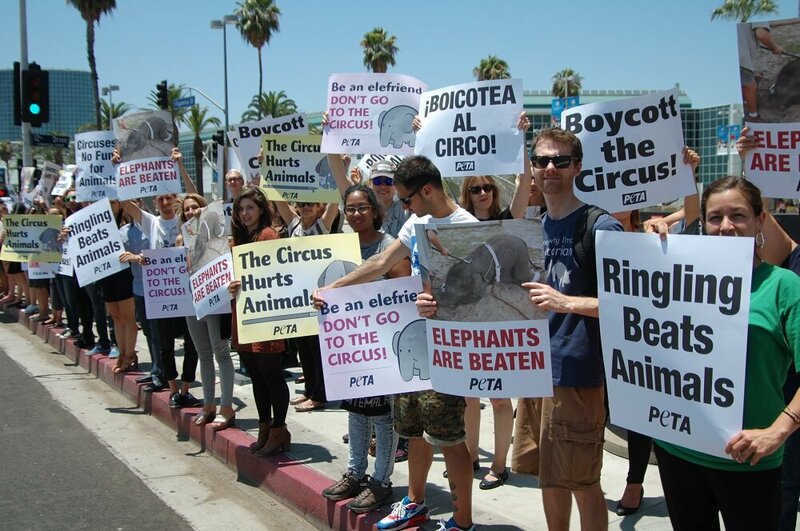 Here are the facts about the 36-year old battle between PETA and the Ringling Bros Circus. The days of animal circuses are numbered as more and more people come to realize that it’s no longer fun at all to watch. What could be fun about paying to watch sad animals being paraded or coerced to perform tricks? Well, as several animal conservation groups continue to pass the message about the ills of wildlife entertainment, one organization that has achieved some serious mileage is PETA. PETA is the acronym for ‘People for the Ethical Treatment of Animals.’ It’s a not-for-profit organization that has dedicated its entire focus and energy in the fight against animal abuse and cruelty. Recently, PETA celebrated the end of a long battle against the Ringling Bros that lasted nearly 36 years. Below we look at the facts behind this ‘battle’ and the final outcome. While it might appear obvious that PETA finally managed to make Ringling Bros bow to their demands owing to their stringent fight, and relentless strategies, the motive behind this fight was probably the most influential force in that battle. For more than three decades PETA fought the Ringling Bros. Its motive was clear on placards, T-shirts, posters, stickers, and leaflets; put an end to animal cruelty and send captive animals to sanctuaries. Consequently, PETA became one of the greatest foes of the Ringling Bros.
Who Are The Ringling Bros And Why Were They PETA’s Target? Ringling Bros is a US-based circus group with decades of experience in animal entertainment through their many circus performances. Ringling Bros and Barnum & Bailey is a merger of two companies, Ringling Brothers and Barnum and Bailey. The two came together in 1906 after the Ringling Bros bought Barnum and Bailey. The merger officially started a traveling circus in 1919 by the name Ringling and Bros. and Barnum & Bailey shows. The circus grew in popularity through its exhibition of shows depicting wild animals submitting to instructions and performing spectacular tricks. Usually, the animals would include elephants (whether Asian or African), lions, tigers, lamas, wild geese, and pigs, among others. With demand spreading widely across America, the circus had to transport the animals in cages and in boxcars along the railway. As expected, the animals also had to go through intensive training in order to wow the audience. But there were major problems with this business model. The continuous traveling and rigors caused the creatures to quickly grow old and weary. Hence they were always replacing them with younger ones which were also trained at a young age and kept in line for their spot. But as the show continued to appeal to its audiences, something else was cooking underneath. There was a growing loathing for the acts of the Ringling Bros.
For decades, Ringling Bros called their performances “The Greatest Show On Earth.” Animal activists disagreed. trainers were abusing them in several ways just to subdue and control their wild spirit. PETA also managed to find evidence of a number of animal deaths that occurred in Ringling Bros hands, at least since the early nineties. The tally came to approximately 30 elephants. In addition, very young elephants were routinely stolen from the jungle and forced to live in cages under unsanitary conditions. With all this evidence, PETA began to take action against this circus. Meanwhile, though Ringling Bros constantly defended their acts, claiming that they kept the animals under protection, the evidence from PETA was a force to reckon with. First, the photographs and video evidence collected by PETA was enough to stir the public into action about supporting the circus through ticket purchase. Strangely enough, many of these photographs and videos were taken by Ringling Bros employees. These staff were also fed up and worried about the abuse the animals were going through. Eventually, some employees also resigned and joined PETA in its fight against the Ringling Bros.
For instance, Archeele Hundley, after continuously pestering the management to stop animal abuse in vain, resigned from the company and joined PETA. With him came more secrets about the Ringling Bros that they hid from the public for many years. For example, he revealed that all the animals were beaten for at least 30 minutes everyday! While many elephants suffered various illnesses, others either died, or lived with deep wounds the rest of their lives. Baby animals were not spared either. Armed with all the facts, PETA staged fierce demonstrations, advocacy campaigns, boycotts, and set legislative procedures in motion, all in a bid to stop the Ringling Bros. This mass action lasted more than 30 years sometimes owing to the slowness of the court process. Benjamin the young elephant who drowned in a training pond. The pace of things picked up around 2011 when PETA finally convinced the United States Department of Agriculture (USDA) that Ringling Bros was acting unlawfully. Especially as regards the use of bullhooks. After investigations, the USDA found Ringling Bros guilty and charged them a whopping $270,000 fine. This prompted them to declare the end of using using bullhooks. By early 2017, Ringling announced that it would close shop. This announcement did not only come as a victory for PETA, but also for many animals which were later freed and taken to credible sanctuaries. This entry was posted in Elephant Information and tagged African elephant, Asian elephants, elephant captivity, elephant conservation, elephants, PETA, Ringling Bros Circus on October 22, 2017 by Roselyn Onuche. Thank you in advance for freeing our beautiful animals!!! Please, release the animals to sanctuaries!! Please free our precious animals!! They deserve freedom !